The newest trend is that senior citizens purchase tiny homes, usually wooden, and often on wheels, for their post-retirement years. These homes are easier for them to live in, without worrying about a mortgage, and excess space. They are cozy and compact and are excellent for the needs of the elderly. According to 72-year-old Bette Presley, her tiny mobile 166-square inch home in Arroyo Grande allows her to live a comfortable, off the grid, life. Her tiny home has solar panels installed, and she kept only the essential items inside. In this way, she could reconnect with nature, and enjoy her peaceful, calm life. Moreover, the 61-year-old retired music teacher Adele Smith claims that the size of her large house was too much for her after her daughter moved away. She watched TV in a little corner of the living room, and used the bathroom and my bedroom and the kitchen. Yet, she felt that she was just storing things in her house. Therefore, she decided to buy a tiny home, and she replaced her 1300-square-foot with a 140-square-foot bungalow in Oregon. A lot of elder people move to smaller homes in order to save money, as these tiny houses are affordable, ranging from $10,500 to about $20,000. They are a great option for seniors who dislike assisted living since they suit their physical and mental needs. 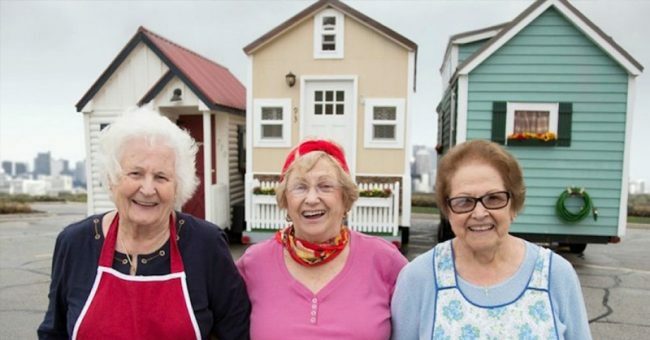 Some tiny homes have voice and visual assistants to remind the elderly of certain things. A similar example is Dani Moore, who suffered from osteoporosis, and had a wheel-chair ramp installed in front of her house, and a chain host with a rock climbing harness to help her lift off her seat. Moore, who runs the blog The Tiny House that Grandma Built, was interested in the idea of owning fewer things and downsizing her life , since she remembered the stress of moving her own mother into assisted living and having just two weeks to sort through her numerous possessions as a real nightmare. She thought that she would not like to do the same to her daughter. For now, though, Moore is still thriving in her accessible home, and she hopes to stay as long as possible, as she likes living independently. She says that when she would not be able to live on her own, which she hopes won’t be soon, she will have to find another path. The tiny homes designed and constructed by MEDCottage are nicknamed “granny pods”, and are fully equipped to ease the life of the elderly who live unaided by nurses and caregivers. The group of three Italian grandmothers, The Sausage Nonna, uses their small homes to run a wonderful sausage delivery service in Chicago. They make sausages on Sundays for events, and move to various locations, and set up their shops on site. Sometimes, they even deliver batches to their clients.